I limped into Kia service this morning on the emergency spare tire that had to be changed in the highway Saturday. The K900 service guy, Craig, found the breach in the sidewalk that caused the flat. He also took pics of the chrome peeling off the edges of the rim. I don’t know if it was doing that before the flat. He didn’t have a tire, but he’s getting me one. He’s also ordering me a new rim under warranty. He got me an Optima loaner for a couple days until the wheel comes in. So, all told, better than I’d feared. 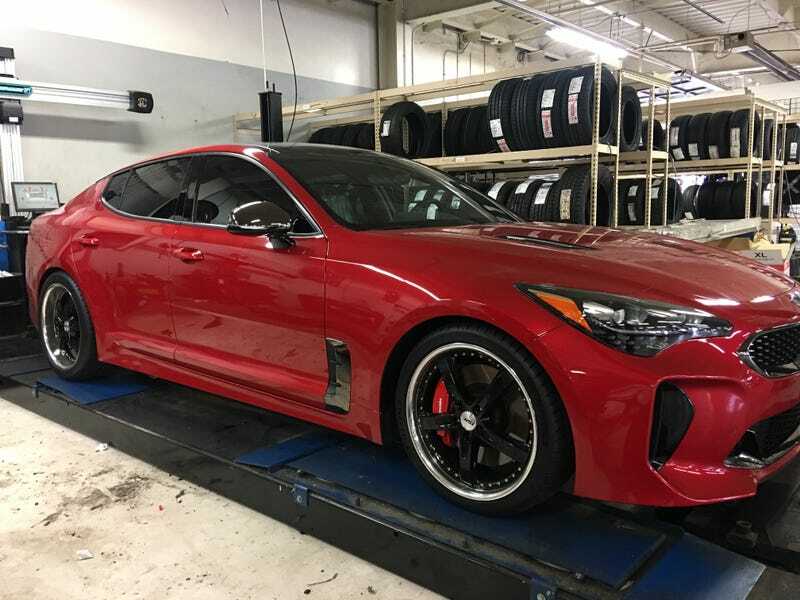 Then, he took me back to the bay where they were working on this Stinger GT. The guy who bought it is having them put on pretty much every dealer option available. New exhaust, and a bunch of other stuff I can’t remember. You can see the new wheels and the brakes. They’re also lowering the suspension. They techs are really enjoying putting this car together. The whole thing is adding about $8k to the price. I sat in one, the interior is nice with real aluminum trim. I put it halfway between my Sedona and my K900 on the poshness index, which is appropriate.